Rev. Janet Kroboth-Weber has over 25 years experience in design, photography & teaching. As an apprentice to indigenous elders since mid 1990s, she assists with ceremonies & cultural presentations. Serving as personal assistant to International Council of 13 Indigenous Grandmothers since their founding in 2004, Rev. Janet Kroboth-Weber presented their documentary "For the Next 7 Generations" at numerous screenings and is endorsed by Council to speak to public about their mission. She received a ministry ordination from The Center for Sacred Studies in 2009, a program centered in earth-based ways of prayer (13 Grandmothers part of curriculum). Engaged as a 'bridge-builder', Rev. 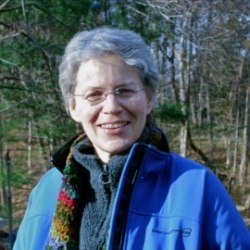 Janet Kroboth-Weber focuses on cross-cultural global traditions, human rights, the environment, sacred activism and has participated in memorial walks: Wounded Knee Massacre (South Dakota) & "March of the Living" pilgrimage (Poland-Israel) with WW II Holocaust survivors/descendants; fracking, nuclear power & disarmament (NY). She continues to support indigenous elders in efforts towards 'Mending the Sacred Hoop.' and is presently working with local/regional spiritual & environmental groups.